This weekend I went and explored my kid’s side and tried to see what all the fuss was about for the movie Zootopia. While me and my three other friends went to go see the movie we were the only ones over 12 years old who did not have children. For a children’s movie it turned out to be good and had morals that children would understand. It is important that children are watching things that are teaching them good lessons. This movie had good messages about stereotyping, perseverance, and discrimination. With the movie it, addresses how some animals deal with stereotypes based on preset judgments. It gets you thinking whether or not to trust certain animals because of certain interactions that you had with them. It makes you think if all predators are vicious just because you had one encounter with a predator. 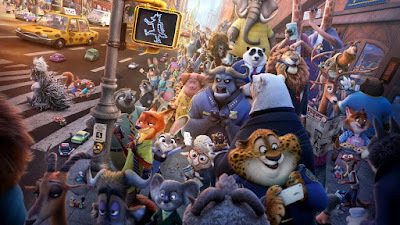 The movie starts to make children realize there is more to an animal than what is on the outside. It is important know that every animal is different and they are not all going to act the same way. Just because an animal grew up a fighting to get their meals, does not mean that they will continue to do this. The message really was prevalent with one of the main characters, a fox played by Jason Bateman. It related to the question can a sly fox be trustworthy or will other animals always look at it as it being sly. Hopefully children get the meaning that this can relate to people as well. That not all people act the same in certain identifications, so judging them based on experiences will do no good. The movie also teaches children a lot about perseverance as well. The main character in the movie is a small bunny who has always wanted to be a cop. Everybody around her tells her that she will never make it as a cop, but she keeps trying anyways. When going to the police academy things start to get hard for her but she never gives up. It is good for children to know when others doubt you as long as you believe in yourself; you can accomplish whatever you put your mind to. When she becomes a certified police officer the captain underestimates her ability, but that does not stop her. She continues to do her best and blow everybody out of the water. She realizes that people may think things about you, but you are the only who controls how you do. Throughout the movie the topic of discrimination is also discussed. There is a scene in the beginning when a store will not serve a certain type of animal . The main character goes in there and tries to get justice for that animal. They try to point out the importance of being fair to all people. In the movie most animals are able to work and live in a cohesive environment. It is good that the movie is getting this message across to the children. Overall this movie had many great morals to provide to children. It is important that they know to follow their dreams and know that they can do anything they put their mind too. Children also need to learn about stereotypes as well, and the importance of judging everyone fair. With seeing discrimination children are learning to treat everyone fair. It is good to know there are good movies out there that are getting children to learn and think.